This week’s lesson explores the cost of discipleship by which the disciple considers the cost/benefit of following Christ. I agree with the author’s overall summary of thought—the temporary cost of discipleship is diminished by the eternal reward of eternity with God. The context of the 1 Peter 2 passage is submitting to authority (v. 13); being a submissive servant even to those unreasonable (v. 18); and enduring persecution with patience (v.20). These are the ways in which Christ is our example. Certainly we are called to suffer like Christ suffered for us. However because Adventism understands that Christ had a human nature with the potential to sin (not divine and sinless); it is important to make a distinction between Adventists’ understanding of Christ as our example and Christianity’s worldview of Christ as our example. In Adventism Christ is our perfect example and a standard we can attain. Adventism teaches since Jesus had a human nature like us, He lived a life of temptation and potential to sin and was only able to overcome sin through the power of the Holy Spirit (ie: temptation in the desert with Satan). Therefore we can overcome sin too—if we live a disciplined life of obedience as guided by the Holy Spirit. In the Christian world-view, while we are called to suffer like Christ suffered, Christ is our perfect substitute not our perfect example in which we can perfectly follow in His every footstep. Of course the idea that Jesus could have sinned negates the fact that Jesus was born both human and divine and therefore could never sin. While Jesus had a human nature, He did not have a sin nature. Christ as our example also undermines the fact that every human is born under the condition of sin and death. In other words, from conception and birth we neither become sinful nor more holy by how we live. We are born sinful, and therefore dead in spirit. Thus, to receive eternal life it is necessary for every sinful man/woman to be born again (ie: spiritual birth, John 3:3-8). As a result of placing our faith in Christ we become partakers of Christ’s divine nature and His righteousness (2 Peter 1:4; Rom. 4:5). We are declared righteous (justification) not by anything we’ve done to become more holy but because we have believed by faith that Jesus is the Righteous One, Messiah Savior (Rom. 4:5). Via our new birth, we are born into the family of God and as His children we are rightful heirs with Christ because of Christ alone (Rom. 8:14-17). So while Christ is an example to us of how to endure suffering it is worth noting that we could never possibly suffer to the degree He suffered for sinners like you and I. Because we are born with a sin nature we are all born children of wrath (Rom. 2:5). However, those who place their faith in Christ alone and receive His death and resurrected life as a substitute of their own escape the wrath of God and receive eternal life (John 3:36). Believers, disciples’ of Christ, will never experience what Jesus has suffered for mankind. We could never endure the cup of wrath Jesus drank for mankind while He was nailed to a cross for our sin. Christ is our example in enduring suffering and there is a cost associated with discipleship. Jesus Christ left His throne in heaven to be man’s humble servant—even unto death on a cross (Phil. 2:8). But His cost (wrath—the cup of God’s righteous anger) is incomparably greater than ours both in weight and matter. Jesus bore the wrath of a righteous God for each sin while the believer suffers for His association to Christ. Jesus endured God’s wrath for our sin paying the high cost of sin for us—He is our substitute. When we believe in Christ we escape God’s wrath and judgment . We are no longer under any condemnation (John 3:36; John 5:24; Rom. 8:1). This quote by the Seventh-day Adventist (SDA) prophetess, Ellen G. White, perfectly illustrates the SDA idea that Jesus had a human (sin) nature by which He overcame through the power of the Holy Spirit. And like Christ, our example, we can also overcome sin—through exercising strict disciplines and obedience. Man’s ability to reason is the reigns of control to prevail against sin. The author’s thought reveals the SDA understanding that our sin condition is relatively benign by minimizing our sin condition merely describing it as “character defects” that we can overcome by living a disciplined life. In other words our sin nature, our flesh, is overcome by a “disciplined response” as the Holy Spirit guides us. There is no necessity of putting to death our sinful flesh and becoming partakers of Christ’s divine nature via the new birth (John 3, Rom. 7:4-13). The quotes from the lesson also emphasize the idea that God in Jesus Christ and man are equal in self-control. Man only needs divine guidance, not divine resurrection power (death to self and life in Christ—Rom. 6:1-11). Man’s ability to “reason” or their belief and therefore subsequent action can be controlled in his/her flesh as the Holy Spirit guides him/her. This is counter to Spirit-living. Man’s thoughts and ways are not God’s thoughts and ways. Man is fallen and sinful and therefore it is critical that man be born-again of Spirit—partakers in Christ’s divine nature. Flesh/sin is not overcome by reason, disciplined living, or obedience. It is overcome by the Spirit of God—when we are born again—Spirit gives birth to spirit (John 3:6). It is via the new birth and the indwelling of the Holy Spirit that we become partakers in Jesus’ divine nature and are given His Spirit, divine power that overcomes flesh and sin. Verses three and four tell us how we live a disciplined life. Because we are partakers in His divine nature we have been given divine power that has granted us everything pertaining to life and godliness which, as the passage continues on, includes moral excellence, knowledge, self-control, perseverance, godliness, brotherly kindness, and love. These are all characteristics that result from Christ’s divine nature in us—His divine power (ie: Spirit-living). They are not characteristics that we could manufacture through exercising rigorous disciplines or obedience. The author quotes Ellen G. White where she asks the “runner” (professed believer) to run unencumbered by indulgences, amusements and luxuries in order that they may through “severe and continuous” discipline (self effort and obedience) train themselves for eternity. In Ellen G. White speak, “severe and continuous” disciplines is code for following extreme dietary restrictions (vegetarianism with preference to vegan diet), restricting various health-related and social behaviors (ie: no smoking, no drinking alcohol, coffee or tea, in addition to abstaining from things such as movie-going, dancing, playing cards, etc) and last but not least, keeping God’s 10 commandments perfectly—most importantly the 7th-day Sabbath. This self-effort is necessary for eternity because in the Adventist’s worldview, each man must be found “good enough” or safe to save unto salvation. In the Adventist “Great Controversy” paradigm, during the end times the professed believer will be left without Divine Power (the Holy Spirit) to obey all God’s commandments. This idea exactly contradicts the Word of God (Mt. 18:20; Heb. 13:5). All of mankind are born with a sin nature. This is a deadly condition we are born with and it means we are born separated from a righteous God, dead in our sin. We need a remedy that is greater than overcoming “character defects” (sin). Sinful man must be born again of Spirit. This is the remedy by which we become partakers in Christ’s divine nature and through His divine power are now given the ability to overcome sin when we walk in the Spirit. As a result of the new birth and indwelling Spirit we are given divine power. It is His power, not our strict disciplines or even obedience (self effort) that helps us live godly lives. It is His. His divine power has granted to us everything pertaining to life and godliness (2 Peter 1:3). In the Adventist world-view “severe and continuous discipline” is the remedy or antidote for sin. In the Christian world-view it is the forgiveness of sin through belief in Jesus Christ by which we are born again and become partakers in Christ’s divine nature therefore receiving the indwelling of the Holy Spirit which empowers us to live godly lives. “The harvest has ripened; millions await the call to discipleship. We have been blessed not only with the gospel but also with the gospel in the context of the “present truth”—The three angels’ messages of Revelation 14, God’s last warning message to the world. While the above statement from this week’s lesson might seem harmless in view of the Great Commissioning, it’s important to point out their reference to the three angels’ messages of Revelation 14. Through their prophetess Ellen G. White who received “special revelation”, Seventh-day Adventists understand that they are the true remnant church of Revelation because they keep all the commandments of God (Rev. 14:12)—most importantly the forth commandment regarding keeping the seventh-day Sabbath. Accepting God’s invitation, as the author suggests, means not just receiving Jesus alone for the forgiveness of sins and reconciliation with God, but also keeping the seventh-day Sabbath. Adventists have a faith plus works gospel. The commissioning to make disciples then becomes compromised because they teach and insist that only those disciples who keep the seventh-day Sabbath will be saved. This sets up a scenario by which SDAs must “convert” believers from other denominations in order to indoctrinate them in Sabbath-keeping unto salvation. The Seventh-day Adventist Church has a misunderstanding of John’s word/useage— “commandments”—in Revelation 14:12. Surely John is consistent in his own writings and account of what Jesus spoke. A disciple will continue in God’s word, know truth and the truth will set them free. One Biblical truth Adventists do not understand is that Jesus has set us free from the obligation to keep the Old Covenant Law including the 7th-day Sabbath (Gal. 5:1; 5:18). Is the fruit of agape love “our” fruit or the fruit of the Spirit (Gal. 5:22-23)? This new commandment (“entole” in the Greek is teachings/commandments of Christ) to love is a better interpretation and understanding of Rev. 14:12 (which also uses “entole” for commandments) instead of understanding the passage through the filters of the 10 Commandments or Old Covenant Law. Jesus Himself taught that the Old Covenant Law (which included the 10 commandments) was fulfilled when we love God and love our neighbor (Mt. 22:37-40). Using John’s understanding of commandments as teachings of Christ is consistent particularly because we know the Old Covenant was given to Israel alone (Ex. 19:3-6; Deut. 5:3) and the entire Old Covenant Law was fulfilled and we are no long under any obligation to continue keeping it (Mt. 5:17-18; Rom. 8:3-4; Gal. 3:23-25; Col 2:13-17; Heb. 8:6-7, 13, etc). When believers abide in Christ, they bear much fruit and prove to be His disciples, which glorifies the Father. Note that the passage says those who abide in Christ (born-again believers) will bear much fruit and so prove to be His disciples. It does not say if they endure “severe and continuous disciplines” (such as Sabbath-keeping) they will prove to be His disciples. 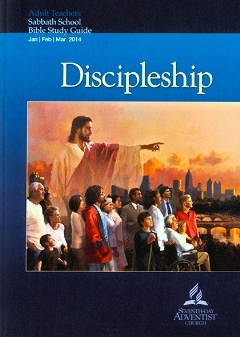 Adventists understand that the mark of a true disciple is one who keeps all the 10 commandments of God (Rev. 14:12) including the seventh-day Sabbath. As disciple-makers it is paramount that they teach and convert others to keep the seventh-day Sabbath—otherwise their salvation is at stake. When we walk in the Spirit (Spirit-living) His Spirit fulfills the Law in us. Disciples are called to walk in the Spirit which reveals Christ’s righteousness in us. Obeying the Law does not make us become righteous. The best the Law can do for us is charge us guilty of sin (Rom. 3:20); arouse or increase sin (Rom. 7:5); act as a ministry of death and condemnation (2 Cor. 3:7, 9), and send us to our need for a Savior (Gal. 3:24-25). But when faith comes, we are no longer under a tutor (Law), Gal. 3:25. Yes, a disciple must understand there is a cost associated with following Christ. However, compared to Christ’s cost for our sin, our cost is no cost at all. In the words of the apostle Paul it is all rubbish compared to the surpassing value of knowing Christ. Copyright 2014 BibleStudiesForAdventists.com. All rights reserved. Revised March 19, 2014. This website is published by Life Assurance Ministries, Camp Verde, Arizona, USA, the publisher of Proclamation! Magazine. Contact email: BibleStudiesForAdventists@gmail.com.